Woolworth Misfortune: “How Not to Provide for Heirs” | The Levin Law Firm - Philip Levin, Esq. In an effort to help educate your clients about the importance of taking action now to protect their estate, I wanted to share the following true story with you. As the title indicates, this is a case study detailing how not to provide for for heirs. I hope this story provides your clients with the incentive and a sense of urgency to plan now to protect their estates. At the age of 10, Barbara Hutton, granddaughter of F. W. Woolworth and niece of E. F. Hutton, inherited $25 million. The money stayed in trust, managed by her stockbroker father, Frank (E. F. Hutton’s brother), until Barbara was 21. Unfortunately, 46 years and 7 husbands after she inherited her share of the Woolworth fortune, Barbara Hutton died with a mere $3,000. By the time the money was distributed outright to Barbara Hutton in 1933, at age 21, her fortune had ballooned to $40 million, thanks in part to Frank’s astute decision to sell out early enough in 1929 to miss the crash in October. After receiving her $40 million inheritance in 1933, Barbara gave her father $5 million as a thank-you gift for his management services. Then, she embarked on the sad and what became a lonely life of a socialite, where she was both envied and exploited for her money. Keep in mind that $40 million then, would be worth approximately $500 million today. Barbara Hutton’s inheritance made headlines around the world and potential suitors quickly lined up for the attentions of the “million-dollar baby”, even before she hit the age of 21. Ultimately, of Barbara’s 7 husbands, the only one who received no alimony was actor Cary Grant. Each of her other husbands, after living very lavishly, received a substantial portion of Barbara’s fortune in connection with her divorces. When she died in 1979, at the age of 66, her share of the Woolworth fortune, as noted above, had dwindled to a mere $3,000. 1. What could F. W. Woolworth have done differently to protect his granddaughter and what could she have done differently to protect herself and her assets? 2. What lessons can we draw from Barbara Hutton’s life, (which included drug addiction and outrageous spending sprees) in order to help our clients protect their loved ones? 3. How can your clients avoid the mistakes made by F. W. Woolworth, which allowed his granddaughter to receive $40 million, in cash and securities, on the day she turned 21? Shortly before his death, F. W. Woolworth had his attorney prepare a Will that would have distributed his estate among his wife, daughters, grandchildren, friends, and charities. Under the terms of the new Will, his granddaughter Barbara would have attained merely “average” wealth. However, Woolworth failed to sign his new Will. When he died, his entire fortune passed to his wife, Jennie Woolworth, who was hospitalized. When Jennie died, the money was split three ways: two-thirds to Frank and Jennie’s two surviving daughters, and one-third to Barbara, the only child of their third daughter, Edna, who had committed suicide when Barbara was four. Because Barbara was a minor at the time, her share of her grandfather’s inheritance was placed in trust. But once she turned 21, Barbara was entitled to receive her entire fortune, outright in one lump sum. Had F. W. Woolworth designed the right kind of trust, Barbara Hutton might have led an entirely different life. The beauty of a trust is that the grantor can include specific provisions to protect their beneficiaries from both creditors and predators. Woolworth could have provided for a certain percentage of his assets to be paid out to his beneficiaries at specified intervals, such as 25% at age 30, 25% at age 35, and the balance at age 40. Or, he might have provided that a specified amount of money be paid to his granddaughter upon the occurrence of one or more specified events. A popular trust that my clients often establish for their children and grandchildren is known as an “Incentive Trust”. A typical “Incentive Trust” may specify that a certain amount of assets from a trust be paid to the beneficiary upon attainment of certain levels of education or to match income levels earned by a beneficiary. One of the most important estate planning goals of our clients is to create a plan that preserves their wealth and protects their loved ones from losing motivation. 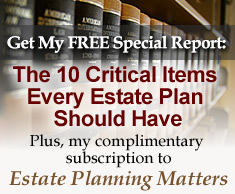 As an estate planning attorney, I am called upon to design trusts for my clients who want to provide financial benefits to their spouse, children, and other relatives, but also want to make certain that inheritances are protected from rapid dissipation by beneficiaries, as well as from outside assaults by predators, divorce settlements, and frivolous lawsuits. While Barbara Hutton could have executed a prenuptial agreement before each of her marriages, to protect her fortune in the event of divorce, even without a prenuptial agreement, the right kind of trust could have insulated her inheritance from the claims of her ex-spouses. It is impossible to know how much of Barbara Hutton’s tragic life was caused by her early inheritance, received outright in one lump sum, and how much was attributable to the dynamics of her family life. What is evident is that, over 30 years after her death, her story provides us with a roadmap detailing….”How Not to Provide for Heirs”. At The Levin Law Firm, we work with individuals to ensure that their property distributes to whom they want, when they want, and how they want, at the lowest possible overall cost to the client and their loved ones. Please do not hesitate to call The Levin Law Firm concerning specific client situations and to arrange a Complimentary Consultation with your selected clients to help them achieve their estate planning goals.